"HI (Hostelling International), formerly known as International Youth Hostel Federation (IYHF), is the federation of more than 90 national youth hostel associations in more than 80 countries who have over 4,500 affiliated hostels around the world. The youth hostel movement was begun in 1909 by Richard Schirrmann, a German schoolteacher, and Wilhelm Münker, a conservationist, who saw the need for overnight accommodation for school groups so that they could experience the countryside. This started with schools being used during the holidays. The first Jugendherberge (youth hostel) was opened in Schirrmann's own school, in Altena, Westphalia. In 1912 it was replaced by a permanent hostel in Altena Castle, and there is still a hostel in the castle grounds today. Schirrmann founded the nationwide German Youth Hostel Association in 1919. The movement spread rapidly worldwide so the International Youth Hostel Federation was founded on 20 October 1932 in Amsterdam by representatives from associations in Switzerland, Czechoslovakia, Germany, Poland, the Netherlands, Norway, Denmark, Britain, Ireland, France and Belgium. In 1933 Richard Schirrmann became the president but was forced to resign by the German Government in 1936. Youth hostels were originally very different in setup from other modern hostels, although the growing popularity of the backpacker subculture has forced them to adapt so as not to lose customers, most notably abandoning the idea of chores in all but a few of their locations. The youth hostels in the United States, started by Monroe Smith, (where backpackers have not made as much of an impact as elsewhere) are still closest to the original setup. 87 national youth hostel associations are members of Hostelling International with over 4000 hostels available worldwide. Based in Welwyn Garden City in England opposite the train station and the Howard Centre, the organisation provides services for travelers and coordinates the national organisations. It also facilitates youth work and international and cross cultural understanding in conjunction with UNESCO". The flag is a white horizontal background with the logo in the middle. 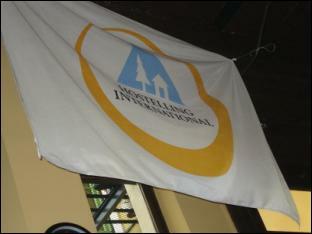 This image taken on September 9, 2011 in a hostel in Buenos Aires, Argentina, member of HI).